During your cabin stay in the Smoky Mountains, your time is precious, so here’s a guide to some of the best quick and super-easy ways to venture outdoors into nature and the mountains. Even though the cabin life is great to hang out in, if you want to get out, here’s how to take an hour or two for short excursions that create family memories forever. If you want to enjoy the abundant nature experiences and scenic views of the Smoky Mountains, but you’re not an experienced hiker, or you have young children or physical challenges, the very best news is that the park rangers have done amazing things to help share their national park with you. There are walking trails that even a wheelchair or baby stroller can go on. There are scenic trails that you can drive along and stay in your vehicle. There are waterfalls you can drive up to see. We’ve gathered some of the best easy nature experiences for you. Use our guide to some of the best places to take an easy walk, even by wheelchair, and still enjoy the outdoors hiking views of Great Smoky Mountains National Park: Easy Walks in the Smoky Mountains. Be sure to check all the links in that article to the public parks and especially to the Roaring Fork Motor Nature Trail. This incredible scenic drive deserves a special mention because it’s really in a class of its own. It’s a nature trail with multiple sights and attractions, but the park has made it a one-way driving loop as well. It’s the best of both worlds, and it starts right in Gatlinburg. The Quiet Walkways are very short trails that lead straight from the road to special places, usually deep in the forest, that rangers have selected for their impact. In a few minutes you can be away from the traffic and the crowds, stretching your legs and plunging into nature. The quiet walkways are typically only 1/4 to 1/2 mile in length, and they’re easy to miss. Most people drive right by them – this works in your favor of course, if you stop. 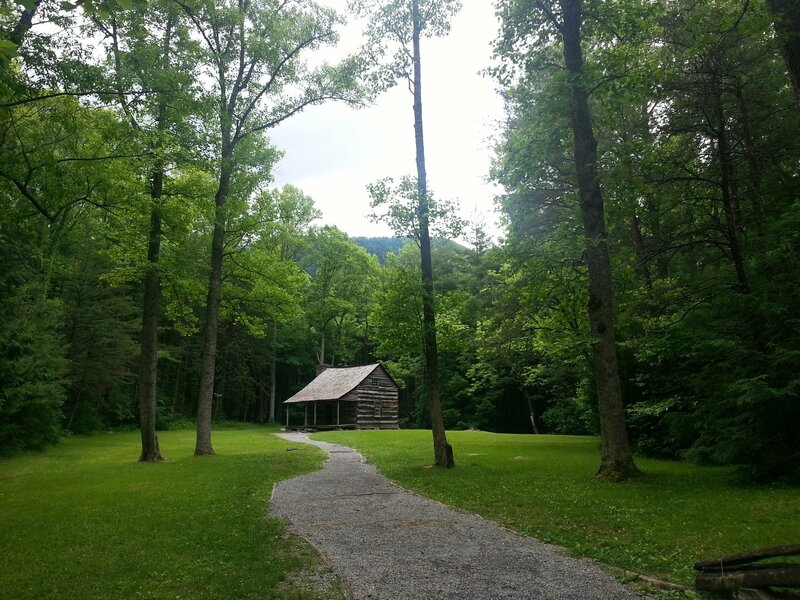 The Quiet Walkways of Great Smoky Mountains National Park are hidden gems. There are about 14 of them throughout the park, many of them along the same highway. Check our guides for some that look good to you, and consider taking a scenic drive with stops for leg stretching and moments of calm, and natural wonder, along the way. The designated Nature Trails are chosen for the significant natural features that they offer. They are short and easy trails, usually less than a mile long, and developed by park rangers with the non-hiker in mind. They lead through stunningly beautiful selected areas of the park. For some of the best ones, see our guide to the Nature Trails of Great Smoky Mountains National Park. While the Quiet Walkways are selected and maintained as brief excursions off the road and into nature, the Nature Trails are created for their superb natural features. Both types of trail are actually hiking trails, and although they’re fairly mild as hikes, they can all be slippery in the wet or close to streams. And in a national park full of trees, there are always roots to watch out for. Always look where you’re putting your feet along any trail, and don’t let children wander. Having said that, 3 of the nature trails are so easy that they’re included in our guide linked above to Easy Walks. Now that you know how special the nature trails are, it’s easy to see that the most unique of all the nature trails is the Roaring Fork Motor Nature Trail, linked to above, the only one of its kind in the park. Most people come to the national park by car, and it’s the most common way to get around. And with so many scenic drives, cruising the Smokies is a joy in itself. These additional walkways and trails are extras that you can map out for yourself, since most of them are along the way to somewhere else, a scenic stop along a scenic drive. There are so many things to do in the Gatlinburg and Pigeon Forge area and Great Smoky Mountains National Park that no one can do everything they would like to. Be sure to see our series of guides to family-fun Outdoor Activities. And here are a few more tips to save you time. Finally, there are several chair lifts and coasters, and other ways to gain altitude and enjoy the mountains, frequently right in town. Remember the chair lifts such as the Gatlinburg Sky Lift, Anakeesta, and Ober Gatlinburg’s ski-mountain chair lift which operates in summer for high mountain views, as well as its famous year-round Aerial Tramway. And for coasters, try the Gatlinburg Mountain Coaster. Anakeesta has a coaster, and Ober Gatlinburg now has its own Ski Mountain Coaster too. Whatever you do to get outdoors, remember to call us anytime at 855-91-SMOKY for answers or assistance, and check our TIPS articles for how to make the most of your Gatlinburg cabin rental and your Pigeon Forge cabin.